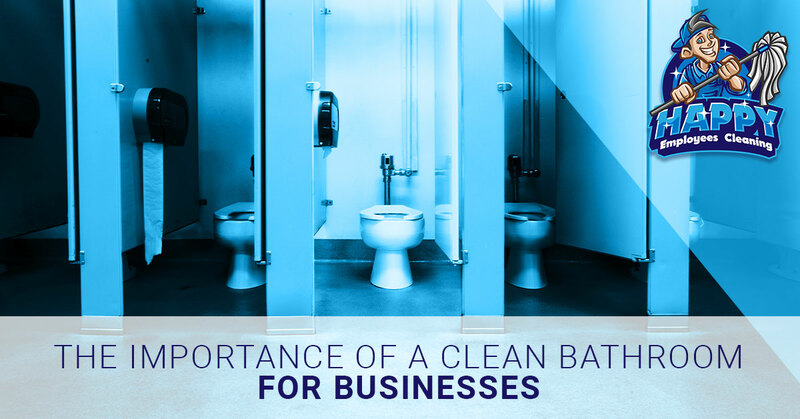 Whether you’re a service business or an industrial warehouse, when customers or clients visit your facility, you will be judged by the cleanliness of your restroom. This is human nature, and maybe it stems from our past where so many people died from preventable diseases due to lack of cleanliness and sanitary conditions. This means you have to have stellar bathroom facilities. If you don’t, you risk losing customers, clients, or even potential clients who are considering doing business with you. Happy Employees Cleaning in West Fargo specializes in commercial cleaning services in West Fargo. We understand the importance of a clean bathroom for your customers and for your employees. In this blog post, we’ll offer up tips on how to make your bathroom sparkle. Toilets. Toilets must be clean. If you have a black toilet, chances are your customers will walk out (and maybe even your employees). To properly clean a toilet (yes, there is a correct way), suit up (grab plastic gloves and eye protection). Clear the area around the toilet. Flush. Squirt cleaning solution around the rim, and let it sit. Clean all surfaces on the outside of the toilet, beginning at the top and working your way down. Pay special attention to the toilet seat and under the toilet seat. This is where people’s bodies actually touch. Clean all around the toilet, including behind and around. Return to the inner toilet. Grab a toilet brush and scrub away any stains and dirt. Finally, flush, wipe away any spots you may find afterwards, and de-suit. A five minute job that so many businesses neglect to do that can cost them thousands in revenue. Sinks. You cannot run out of soap, especially if you are a food service business. Make sure you have plenty on hand and check often to monitor soap levels. Again, suit up with gloves. Spray an all-purpose cleaner to disinfect and help loosen any dirt in your sink. Wipe the interior and the exterior of the sink, making sure you get all dirt, grime, and hair. Rinse the sink, clearing any clogs that may appear. Hair. Let’s face it, other people’s hair grosses us out. And since we all shed between 50 to 100 hairs a day, it’s easy to have this hair fall in a sink. Set up a regular bathroom check schedule so these can be removed promptly. Floors. Make sure your floors are free of dirt, hair, grime, paper towels on the floor, and most importantly, feces. If it’s muddy outside, you’ll have to monitor this more closely in order to mop away footprints. If there’s any one area you always have to have clean, it’s the bathroom. The employee break room can wait. You and your employees have to stay on top of bathroom cleanliness, which can be a challenge in a busy office setting. Luckily, Happy Employees Cleaning is here to help. We do everything we can to make your bathroom shine, such as scrubbing toilets and sinks, cleaning the floors and making sure all residual hairs are gone, and restocking the toilet paper (which leaves the worst impression when you run out) and paper towels. Dust bunnies are our enemies, and trash is our nemesis. Contact Happy Employees Cleaning in West Fargo today for your custom commercial cleaning quote today!